This article is about Master Hand's appearance in Super Smash Bros. 4. For general information, see Master Hand. Master Hand returns as the boss of Final Destination at the end of Classic Mode in Super Smash Bros. for 3DS and Wii U. Master Hand can be accompanied by Crazy Hand with shared HP on intensities 3.0 or above; this happens automatically in Super Smash Bros. for Wii U and at the end of the dark ending path in Super Smash Bros. for Nintendo 3DS. When the two lose a certain amount of HP on intensities 5.1 or higher, Master Hand rips open for Master Core to emerge for the final battle. Master Hand additionally appears in Special Orders as the host of a mode called Master Orders, where players take on one of three challenges issued by Master Hand to earn specific prizes. The more difficult and rewarding challenges require more gold. He appears alongside Crazy Hand and two other characters at the end of the higher-risk Crazy Orders if players have completed enough challenges. Master Hand and Crazy Hand will drop treasure chests containing extra prizes for the beginning portion of the battle. Master Hand's moveset has undergone drastic changes, losing some of his staple attacks such as the Floor Sweep, Flying Slap, and Tri-Poke. However, they are replaced with some all-new attacks, while some of his older attacks have gained additional properties that make them deadlier. He is voiced by Xander Mobus, who is also served as the game's announcer. Master Hand has lost the Floor Sweep, Flying Slap, and Tri-Poke. Master Hand and Crazy Hand now share the same pool of HP. Master Hand has new attacks: Fireball Blitz, Icy Wind, Platform Dealer, Sleeper Grab, Snapper, and Toss Grab. Finger Bullets are no longer absorbable and do 1% more damage. Laser Nails are all on the same plane. They also do 4% more damage per hit. Big Swipe 16% Master Hand makes a wide swipe across the stage. Fake-Out Slap 15% Master Hand holds a fist above the player as if to punch them, but instead opens up and comes down with a slap. Finger Bullet 9% Fires a pair of bullets. At low HP, fires three pairs. No longer absorb-able. Finger Drill 28% Master Hand flies up and comes down onto the player, drilling into them. Finger Walk 12% Master Hand "walks" across the stage on two fingers and "kicks" the player upon reaching them. Fireball Blitz 11% Master Hand produces a large orange fireball and squeezes it, causing it to break into fragments that scatter across the stage. Flying Punch 46% Master Hand zooms in from the background with a punch. Icy Wind 0% from wind, 6% from ice Master Hand flaps rapidly, causing a wind that pushes to the left/right and spawns icy projectiles on higher intensities. These ice projectiles will give the Frozen status effect on impact. Jetstream 33% Master Hand points out his middle, thumb, and pinky fingers and fires into the air like a rocket and swoops in from the background. Laser Nail 8% per hit Master Hand fires a blue laser from each fingertip. Unlike in previous installments, all of the lasers are on the same plane as the player rather than in the foreground or background most of the time, and as such, the lasers have colliding hitboxes at all times, making the attack more effective in general. Platform Dealer 0% Master Hand tosses out orange platforms, which upon landing on the stage, rise upwards in an attempt to drag the player over the top blast line. Each platform covers a quarter of the stage and cannot be dropped through. Power Punch 29% Master Hand hovers above the player and drops down in an explosive fist. If the player is in the air when struck, this attack becomes a powerful meteor smash. Sleeper Grab 11% Master Hand hovers near the player and then grabs them, squeezes them, and if not escaped from, sets the player on the ground in an asleep state. Snapper 11% Master Hand snaps his fingers, creating blue and green energy with yellow stars. If the player is hit by this on the ground, they are instantly stunned. 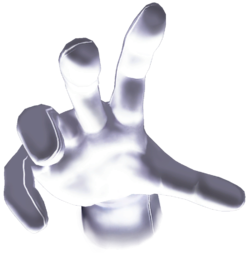 Toss Grab 17% Master Hand hovers near the player and then grabs them, squeezes them, and if not escaped from, throws them backwards. The damage recorded here is only for Master Hand's contribution to the attack. For Crazy Hand's contribution, see Crazy Hand (SSB4). Juggling Act 7% (small), 11% (large) Master Hand tosses a series of small blue-green orbs towards Crazy Hand, who bats them back across the stage. After a few rounds, Crazy Hand begins throwing large blue-green orbs towards Master Hand, who flicks them directly towards the player. These two phases are sometimes reversed. The mysterious Master Hand is the source of creation in the Smash Bros. universe. He appears in Final Destination when all other rivals are defeated. He fights with a diverse move set and only grows stronger if you make him angry. If you know when to fight and when to dodge, you'll take him down! Master Hand personifies creation in the Smash Bros. universe. After defeating all your rivals, you face him in Final Destination. He forms various shapes to unleash a wide range of attacks, and on high intensities he'll become speedier, deal more damage and launch you further. To beat him, you'll need to know when to attack and when to hold back. In the Developer Interview from E3 2014, Master Hand used his KO sound from Brawl as a placeholder. It is possible to attack Master Hand during its disintegrating sequence, before he releases Master Core. Doing so causes respective "hit" effects and hitlag, but no damage. This page was last edited on December 26, 2018, at 19:28.